The New York Times crossword is considered the most clever and engaging puzzle. Many consider it the gold standard among the most widely distributed crosswords. Learn a bit about the puzzle's history and pick up crucial tips for mastering the Times' mind-bending word challenge. The New York Times published its first crossword in the Sunday paper in 1942, some 20 years after they first became popular. What prompted the kickoff? It was supposedly the bombing of Pearl Harbor; an editor decided that given what was happening in the world, readers would want something to keep themselves busy during blackouts drills. The crossword went daily in 1950 without a byline; the identity of the first weekday Times crossword is unknown. Purchasing a subscription to The New York Times crossword gives you online access to the daily puzzle and the iPhone and Google Play apps. You also get access to all puzzles in the paper's archive. There is a free seven-day trial in the app, and if you don't want to subscribe, you can continue to access two selected crosswords from the archive for free which are updated weekly. You can also do the mini puzzle in the app which is updated every day. In addition, individually curated puzzle packs are available for purchase which are centered around a theme. The daily puzzles get progressively more difficult from Monday to Saturday. The Sunday puzzle is larger than the others (21 by 21 squares compared to 15 by 15), but it is about as difficult as the Wednesday or Thursday puzzle. If you want to keep track of how smart you are, use the app's My Statistics page to view bar graphs reflecting the numbers of problems solved, how many you solved in a row, and the average solve time. Short words appear quite often in crosswords, more so than in regular language. Hone your expertise with these 3- and 4-letter answers that tend to repeat. Clues with a question mark at the end mean there is a play on words in either the clue or the answer, as opposed to a straightforward question requiring a direct answer. A rebus involves entering more than two or more letters into a single square. You may encounter this twist in Thursday or Sunday puzzles. The clue and answer have to agree in terms of parts of speech, tense and even language. A singular clue always requires a singular answer; a clue in the future tense necessitates an answer in the future tense; abbreviated clues indicate an abbreviated answer. Clues in square brackets refer to an utterance or non-verbal action. For example, [Dog bark] would be WOOF or [hurting yourself] might be OUCH. 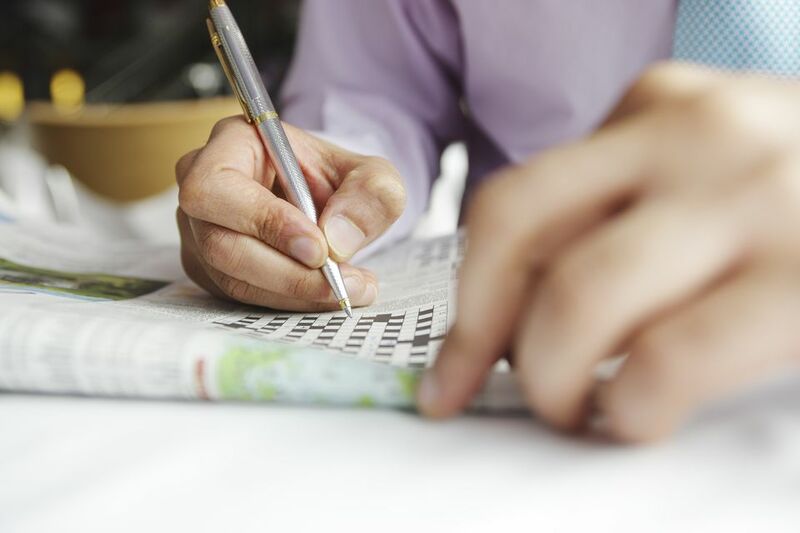 Each crossword from Sunday through Thursday revolves around a theme that connects the puzzle's three longest answers. Answers pertaining to the theme always appear in symmetrical spots in the grid. In 1998, crossword author Bill Gottlieb proposed to his girlfriend in the puzzle. One answer was "A MODEST PROPOSAL" (a Jonathan Swift essay) and another was "WILL YOU MARRY ME" (a Paula Abdul song.) Bill even managed to get his name in there with the answer to "Microsoft chief" (BILLG). His girlfriend answered "in the affirmative" (YES). One of the most notable crosswords was a puzzle published the day of the 1996 election. The answer to the 39-across clue "Mister President" could have been written as CLINTON or BOB DOLE and all the corresponding Down clues and answers would have worked with either choice. As soon as it came out, Times crossword editor Will Shortz fielded angry calls left and right. Some angrily questioned how he presumed Clinton would win, while others chastised him for predicting Dole would take office. Think You Can Solve This Easy Crossword Puzzle?